ears of digital storytelling at conferences taught me an important lesson about the process—it is not always the angle you shoot at or the audio levels being perfect—the most important skill is to arrange the media to create the most impact. Whether it is a shared experience like a conference, or a community story- the resulting digital story needs to evoke an emotion and provoke action. So you’ve shot on location, captured a powerful narrative, photographed the most interesting subjects, and selected the music to drive your digital story. What’s next? Editing presents the most crucial step in actually forming a digital story. Before the editing process begins, all you have is information— useful, with little direction and impact. The editor has all the power to create a story that inspires anger at injustices, empathy for the marginalized, honor for your community, or sensible solutions to an issue. To simplify the process of editing, one must be mindful of logging and cataloguing essential footage, organizing all media in the computer, and finally providing the artistry to make the story come to life. The editing process is like putting together a complicated puzzle. After assessing the media you’ve collected or generated, you can begin assembling the puzzle pieces in a fashion that will elicit the reaction you hope to achieve in your intended audience. Within your computer are all the elements you need to weave together a cohesive and impacting message. While a photo of a run down school yard might evoke a particular reaction, a narrative explaining its budgetary causes along with an interview of a child desiring a safe playground produce extra power and meaning for that image. In any story intended to lead change, it is important to remember the human and emotional effect. For example, add a piano rendition of a popular children’s song as background to the school yard story and viewers will connect in a deeper way to the message. As editor, your goal is to have your audience empathize with your issue. To achieve this, your editing process should be driven by your own empathy with the subject; steer away from over sympathizing. For all other productions, such as personal or oral histories, you’ll want to be mindful to treat your subject with respect and understanding to convey a genuine connection to your audience. There is certainly an artistry involved in editing when you consider the nuances of putting together a meaningful story. At the same time, there are technical aspects of editing that can be learned and practiced to simplify the editing process. Before importing any footage it is important to scan your Mini DV tapes and log the specific pieces of video you want to import. Importing more video than is necessary will take up too much space on your hard drive, affecting your computer’s performance and limiting space for future projects. 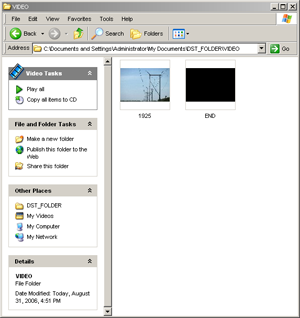 A video log makes efficient use of computer space and assures every shot is reviewed for quality and relevance to the final product. Logging tapes is a crucial step for organizing your video because in the event that you must re import footage, identifying the specific clips you need becomes as quick and easy as reading your log sheet. Appendix VI is a log sheet you can print and use. Below is an example of a log sheet which denotes a clip to be included in a sample digital story. At 19 minutes and 2 seconds into the interview Eddie Anderson conveyed some great advice about the KLCC experience and the log serves to remind the editor of this interesting quote. The Date is important to remind the editor when the tape was shot. When there is more than one camera shooting the same subject, Camera specifies which one was used. It is recommended the camera used to shoot is the same as the one used for importing footage. This minimizes damage to the tape and prevents unforeseen camera/tape incompatibilities. Tape descriptor ties the physical tape name to the log sheet so you may cross-reference and find the tape if you find the need to revisit the tape. Speed tells you the record speed of the tape. Your DV camera may automatically recognize the appropriate playback, but in the event that it cannot, you can manually set the right speed and bypass the problem. Speed also tells you the amount of content available on a given tape. Standard play (SP) typically records 30 minutes less than long play (LP). 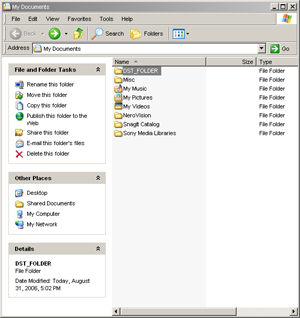 Arranging your media now can prevent the headache of retrieving files from scattered directories. It also makes for easy project back up via an external hard drive or a data DVD. 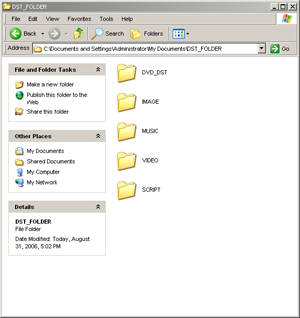 The DVD_DST directory will be revisited at a later time in the How-To, but it is where you will store your digital story DVD information that you can mass produce. 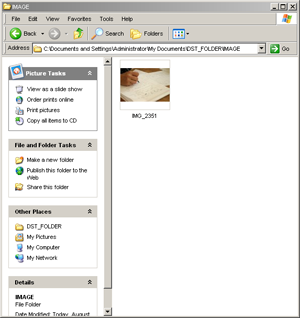 Go to your My Documents directory and create a new folder for the project. This project name should help identify the folder in short order. For the remainder of this walk-through we will refer to it as the DST_FOLDER. The SCRIPT folder is where you can place draft documents pertaining to the story development. These documents can include preliminary images you use to storyboard, a list of potential songs for your musical score, or your written narrative. Recall the exercises on writing your digital story. If you do not have word processing software, there is an online document editor available for use. 3) Images can come from your digital still camera, scanned photos from an album, or the web. These elements are the portal of your digital story, inspiring emotion and visual interest. Images have a greater impact when they are original and relevant to the subject of the story. Be sure to read the license agreement for any conditions attached to the use of the image in a production. 3) Gather photos and images. 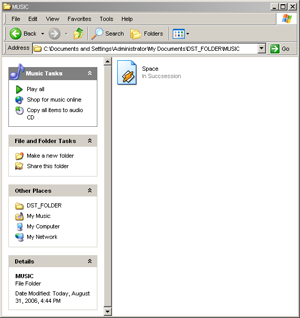 4) Music files come in a variety of formats like .mp3, .wmv, .wav, .aiff. Try to stay within traditional file formats since these are more likely to play within Vegas. Musical elements can come from your favorite album, live band recordings, or from royalty-free collections. The following is an example of a royalty free audio file: Space.mp3 performed by In Succession and downloaded from 15megsoffame.com. Their policy allows free downloads for non profits. 4) Rip or download song files. 5) Video content can be stock footage or personal films that can be imported. Downloading a video clip from the web is outside the scope of this tutorial and is not recommended due to its compressed quality. Make sure to select Sony Vegas Movie Studio+DVD. Directs you to a search engine for creative commons licensed video. You can download the images and compressed versions of the video to follow along with the instructions. For technical instructions on video editing, go to Appendix VII: Editing and publishing with Sony Vegas Movie Studio+DVD.